It’s tough not to smile when speaking with Mary MacLean. Her smile is contagious, her attitude is vibrant and her care is genuine. One of the first residents of the Waterford Barrie, Mary knows that giving back to her community is extremely important. “I wish everyone lived as good a life as I did,” the 99-year-old said as she launched into the tale of her life growing up, starting a family, opening a hair salon and everything else that brought her joy for almost a century. Mary has been donating to charities all her life. When her home, the Waterford Barrie Retirement Community, put on a talent show to fundraise for United Way Simcoe Muskoka, Mary wanted to help in her own way. She decided to handmake dolls and sell them to raise money. Mary MacLean sitting with her Dolls of Joy. She sold these dolls to fundraise for United Way Simcoe Muskoka. Mary’s Dolls of Joy were sold to fellow residents and people in the community in exchange for a donation. 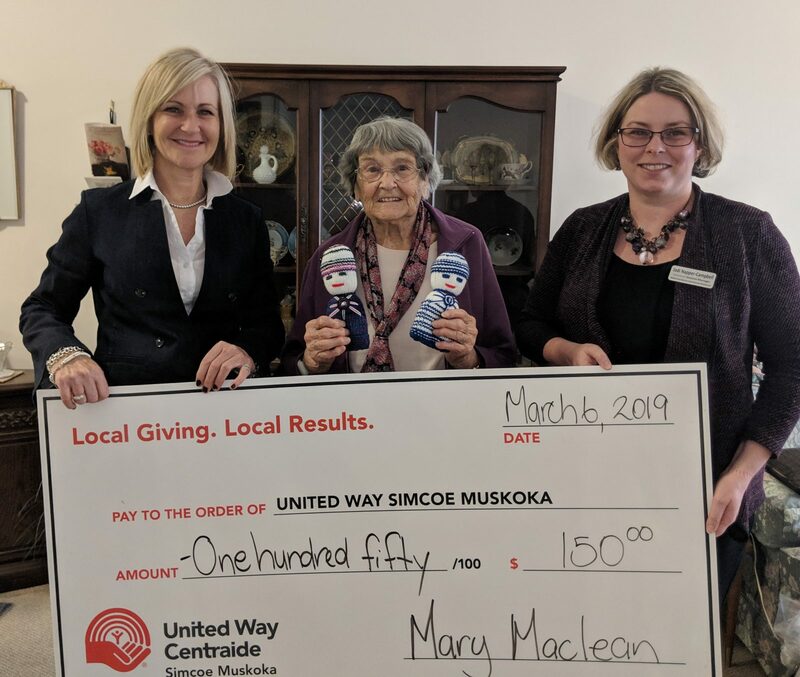 When all was said and done, Mary raised $150 for United Way Simcoe Muskoka. 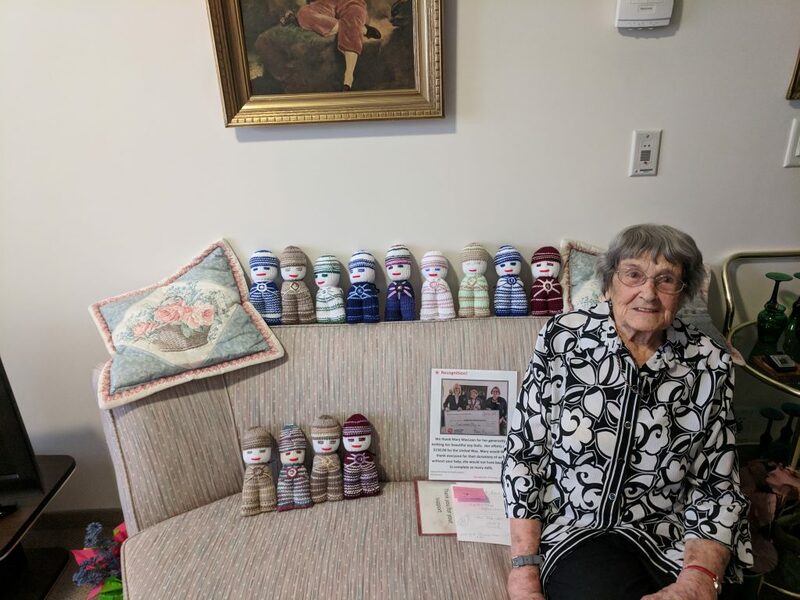 Though she is one of the friendliest people you will ever meet, Mary was almost reluctant to have her picture taken with her dolls and the big cheque. “I don’t see what the big deal is,” Mary said. To her, helping others is second nature. While Mary might not think it’s a big deal, the money she raised will go a long way in funding programs in our local communities. The recipients of those programs definitely think it’s a big deal. Mary has been making her Dolls of Joy for years now, ever since she first moved into the Waterford. They’ve been sent worldwide, too; Mary’s dolls have traveled with organizations like Health Partners International of Canada (HPIC). HPIC includes the dolls in their Humanitarian Medical Kits. The soft, huggable dolls take the place of wasteful packaging to pad the kits and are then distributed to children when the kits are opened. It’s been a while since Mary has sent her Dolls of Joy with HPIC. These days, she uses them to spread #LocalLove throughout Barrie and her community. It seems like there is always someone knocking on her apartment door with a ball of yarn for her to make a doll with. Mary’s fundraising is an inspiring way that one individual is making a difference in Simcoe Muskoka. She knows that our communities face real issues and is combating those issues with love and a genuine desire to spread joy. With her donation, the lives of people across Simcoe Muskoka will be changed for the better. Follow us on Facebook and Twitter to see how United Way Simcoe Muskoka is impacting our communities, and sign up for our newsletter to read more #LocalLove stories like Mary’s.